(PhysOrg.com) -- Although materials scientists have theorized for years that a form of super-dense aluminum exists under the extreme pressures found inside a planets core, no one had ever actually seen it. Until now. A team including researcher Arturas Vailionis of SLAC and Stanford blasted tiny bits of sapphire with a new table-top laser device that penetrates crystals and sets off micro-explosions inside them, creating powerful shock waves that compress the surrounding material. Under these extreme conditions  terapascals of pressure and temperatures of 100,000 Kelvin  warm dense matter forms, the state of matter between a solid and a plasma. Because sapphire is a form of aluminum oxide, or alumina, researchers expected to find evidence of various phases of high-pressure alumina inside the gem. 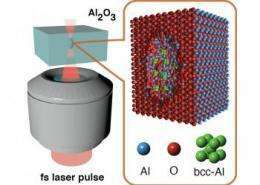 Instead, they observed minuscule amounts of a surprisingly stable, highly-compressed form of elemental aluminum called body-centered cubic aluminum. Their results appear in yesterdays edition of Nature Communications. The team included scientists from Australia, Japan, and the Carnegie Institution of Washington. Vailionis, a researcher with the Geballe Laboratory for Advanced Materials and Stanford Institute for Materials & Energy Sciences, examined the interior of the sapphire and found the novel form of aluminum with a beam of X-ray light from the Advanced Photon Source at Argonne National Laboratory. The laser experiment itself was performed at Shizuoka University in Japan. High pressure experiments generally are done either with big equipment or with a diamond anvil cell where two diamonds are squeezing a tiny bit of material, but even diamond gives up at a certain point with those pressures, Vailionis said. But this very short pulse of laser light actually ionizes all the material within a very small volume over a short time and creates a plasma which is under enormous pressure and temperature without fracturing the outer shell of the sapphire. While scientists long have predicted that new classes of materials with unusual combinations of physical properties should exist under extreme pressure and temperature conditions, only hcp-Al, the hexagonal close-packed aluminum phase, had been observed previously. The form made in this experiment is bcc-Al, or body-centered cubic aluminum. Vailionis said he doesnt expect the research to result in production of new materials in large quantities any time soon, but he believes the equipment used in the experiment offers a new strategy for synthesizing nanoscale amounts of new materials in the laboratory, and opens new possibilities for tabletop research into warm dense matter  the state of matter between a solid and a plasma. Such work could bring scientists a step closer to understanding Earths early history. Now were thinking about different materials we could use to recreate some of the environments that existed deep in the Earths core when the planet was forming, he said. More information: Evidence of Superdense Aluminium Synthesized by Ultrafast Microexplosion, Nature Communications (2011). I wonder what kind of properties this state of aluminum has. I bet it has applications for rocket propulsion. Transparent Aluminum, another Star Trek item that could end up being reality eh. It will still be metallic and not transparent, it is 40% denser than normal aluminium si that is why it is called superdense. This has potential to make other even more superdense materials, and possibly stronger as well. They could be denser than the currently known densest material on earth. Getting the aluminium to part with oxygen is unusual, and ti would be interesting to see the thermodynamics of that!